Almost half (47%) of millennials identified as likely to leave their current role within one year, compared to 33% of Generation X and 25% of baby boomers. That’s right – almost half of the largest working cohort are likely to change their jobs within a year. When considering new roles, 37% of Gen X agreed that work-life balance is the single most important factor after pay. A concept popularised during their formative years, work-life balance is what’s most likely to draw Gen Xers away from their roles. Perhaps the larger corporate hierarchies of yesteryear have taken their toll on the older generations – but scepticism shouldn’t be seen as a negative trait. A third of millennials and 28% of Gen X are frustrated by the lack of career development opportunities on offer, compared to just 14% of boomers. Although it’s safe to say the younger cohorts are hungrier for promotions, it would be a mistake to underestimate the boomers’ ambition. A relatively new concept, a relatively new workforce: millennials appear to be most motivated by perks beyond pay. Millennials identified as most aligned with their organisations’ objectives, and also as the most willing to become more aligned. Contrary to stereotype, it appears the youngest cohort are keenest to engage with the community. Andy Campbell is HCM director at Oracle. As well as heading up thought leadership in the HR wing, Andy works closely with the executive teams of Oracle’s strategic customer accounts. Describing his role as evangelical in style, Andy is responsible for spreading the message that better analytics and cloud technology can have an overwhelmingly positive effect on HR practice. Andy asserts that employees share fundamental needs, but has enough experience of managing multi-generational teams to identify where the real differences lie. We asked him to explain how people managers can tackle some of the problems highlighted in our research. For millennials, there’s a difference between ‘job hopping’ and the process of finding their feet on the career ladder. What’s your advice to HR managers looking to retain talent in the younger generation? Pay and benefits are important, but above all millennials want to know their employer is committed to their development and invested in their career. They expect regular feedback, frequent meetings with their managers, and training that is relevant to their personal development – essentially they want an experience that is personalised to them. It is usually when they don’t see a clear future with their current employer that young employees start to seek something new. Baby boomers and Gen Xers appear to be more loyal, yet less aligned with their organisations’ goals. What can HR managers do to engage the older generations? At their core, all employees have the same fundamental needs. They want to feel engaged, they want regular feedback, and they want to see how their efforts contribute to the company’s overall success. Of course, the older generation does tend to be more loyal once they start to eye retirement and accept that younger workers bring new skills and capabilities to the table. Personal priorities will change over time however, for example older people may give greater emphasis to pensions provision than, say, childcare benefits. It is important that the benefits available to employees can be personalised to reflect these differences. There is a great deal of value in encouraging collaboration between older and younger employees. A recent study by McDonald’s found that job satisfaction among its young employees jumped 10% for those working on multi-generational teams. The business acumen that experienced workers can share with young hires is invaluable. For their part, millennials can help their older co-workers to better understand and take advantage of new technologies. Technology is transforming everything. How can HR managers use it to engage their multi-generational teams? It is about ensuring the user experience is so simple and engaging that it becomes default by nature. People are becoming much less tolerant of badly designed systems and that is why so many organisations are embracing the cloud. Millennials in particular want to focus on their work without being held back by clunky business processes, and companies should absolutely provide them with the technologies to do so if they want to tap into the full potential of their young hires, for example making optimal use of mobile devices. It seems all three generation are calling out for improved communication. How can HR use the data that’s available to enhance communication with their workforce? The way we communicate in the modern workplace needs to change. Millennials communicate through social messengers and group chats in their daily lives and expect the same at work. For example, learning is increasingly being delivered through Youtube style videos rather than traditional classroom training. This improves both the speed and effectiveness of delivery. The ability to like, recommend and share learning content with others is a great aid to enhanced communication. Email is seen as comparatively slow for informal discussion and its use is winding down. We are also entering an era of self-service where workers increasingly favour handling simple HR requests on their own, be it through a simple IT portal or HR chatbot, instead of burdening their HR teams with formal requests. The increasing use of collaboration tools to work on projects and share ideas across geographic, organisational and even demographic boundaries is helping this process, especially when supported by improved mentoring capabilities. The conventional wisdom about generational differences in the workplace is often misguided – grouping huge swathes of the working population according to date of birth can be a reductive practice. By definition, each individual has unique expectations, values and needs – regardless of how long they’ve been on Planet Earth. That said, with a potential age gap of 50 years between our youngest and oldest workers, it’s inevitable that generational experiences will influence workers’ perspectives. Understanding these nuances gives HR managers a head start on adapting activities to best motivate and retain demographically diverse teams. The varying levels of engagement across the generations, and how managers can increase them. Which generations are most likely to contribute to the devastating financial cost of recruitment and retraining, and how managers can avoid both. First, let’s take a look at some of the commonly accepted differences among the generations based on research from Ernst & Young. The project interviewed hundreds of employees to uncover the differences in opinions and working styles of the generations that make up our workforce. It’s worth pointing out that the following profiles are archetypal, and cannot be applied rigidly. Boomers were born into the prosperity and optimism that followed WWII (many of whom in the first free NHS hospitals). EY’s study found them to be the most hard working cohort, playing instrumental roles in the ticking over of organisations. Baby boomers are leaders of huge social change but the study suggests that many struggle to adapt to new developments in the workplace. 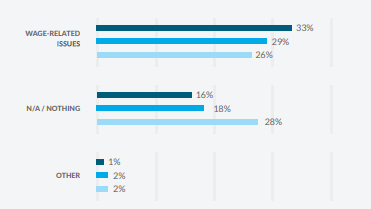 Boomers typically ranked lower in areas of collaboration, compared to the younger two generations. The study found Gen Xers to have entrepreneurial and results-driven character traits. Coming of age in the ‘80s and ‘90s, Generation X are said to value the concept of work-life balance more than the other two generations. The cohort is criticised for not being cost effective and displaying little executive presence. With the likes of Facebook founder Mark Zuckerberg in their midsts, the millennials were found to be the most tech-savvy, displaying the ability to make opportunities through new platforms and channels. Newest to the workforce, the cohort was ranked the most enthusiastic of the three. Millennials were most criticised for not being ‘team players’ or ‘hard working’ in comparison to the other two. Many modern roles are by nature highly stressful and procedurally complex. But whether they involve interrogating data in spreadsheets or compiling tax forms for overseas shoppers, our research suggests that core duties are being exacerbated by a host of avoidable factors. At a glance, millennials appear to be the most content generation at work, with over three quarters (76%) feeling valued or highly valued. This figure drops, but not dramatically, to 71% for both of the older generations – the questions that followed explored why this is the case. The biggest and most widely shared workplace frustration across the generations is a lack of communication, which was ranked number one by millennials (39%), Gen X (36%), and baby boomers (30%). Millennials and Gen X are considerably more frustrated by the lack of opportunities for career development with a third (33%) of each identifying it as an issue, compared to just 14% of boomers. In fact, boomers are considerably more accepting of work-related stresses across the board, with over a quarter (28%) expressing no frustrations at all, as opposed to 18% of Gen X and 16% of millennials. Which, if any, of the following frustrates you about your current role? While a clear solution to work-related frustrations across the generations is open dialogue, it seems managers need to be more proactive in enabling their employees to develop professionally – particularly the younger two cohorts. Boomers, on the other hand, have fewer frustrations, but will inevitably be concerned with health care and pension provisions as they approach retirement. The employee-manager relationship will always be prone to stresses and strains, but the way in which managers address these matters can be adapted across the generations. Our results suggest that boomers – the generation who came of age in the ‘60s – are most sceptical about their managers: over a quarter (27%) disagree that they contribute towards a positive work environment. Just 18% of millennials agree with this notion, suggesting they have much more confidence in those in charge. There are many reasons for this divide in opinion. For example, some members of the older generations may have been jaded by the typically larger corporate hierarchies of yesteryear, as opposed to the flatter management structures known to the millennials. What’s clear is that managers shouldn’t make assumptions: provide formal and informal praise to the older as well as the younger and offer flexibility to all. There are three consistent characteristics in every definition of employee engagement: realising potential, sharing organisational goals, and promoting employee wellbeing. It’s therefore concerning to see that just under half of all generations – 50% of millennials, 48% of Gen X, and 45% of baby boomers – identified as ‘enthusiastic’ about their work. The result of this study point towards two key areas that are driving this disconnect: a lack of alignment with company goals and an absence of recognition for loyalty. Baby boomers feel least aligned with their organisations’ goals, and have the least intention of becoming more aligned. Just 38% of boomers currently feel aligned with their organisations’ goals, compared to 40% of Gen X and 44% of millennials. Despite already feeling most aligned with their organisations’ objectives, millennials are drastically more likely to want to increase this foothold, with almost half (48%) saying they want to feel even more aligned. This desire for involvement appears to decline with age: just 29% of boomers and 36% of Gen X said they want to feel more aligned with their organisations’ objectives. The fact that workers appear to grow disillusioned with age is clear indication that HR managers need to sustain their efforts to engage employees throughout their whole careers – not just the beginning. Three quarters (73%) of millennials, 65% of Gen X and 57% of baby boomers agreed they would be more motivated to work if it was recognised with regular personalised benefits in addition to wage or salary. Interestingly, boomers are the least likely to desire more holiday, with just 40% identifying it as worthy acknowledgement of their work – this is compared to 44% of Gen X and 52% of millennials. It’ll be welcome news to HR managers that an average of 66% of employees agreed regular personalised benefits – such as cost-saving perks, free meals, and gym memberships – would be appreciated as recognition for their loyalty and personal investment. It’s also worth noting that private healthcare and higher employer pension contributions were identified by many baby boomers as highly important as many of their careers draw to a close. The Telegraph recently reported that recruitment and retraining costs the UK £4bn a year (roughly the same as 10% of the nation’s expenditure on defence), while Forbes estimated that organisations with engaged employees enjoy 6% higher net profit margins. So beyond organisational objectives and employee wellbeing, the final area this report covers is perhaps the most financially significant: retaining talent. In the context of the Telegraph and Forbes’ estimations above, the following statistic is particularly troubling: almost half (47%) of millennials and a third (33%) of Gen Xers are either likely or highly likely to leave their current role in the next year. The combination of these cohorts makes up roughly 70% of the entire UK workforce. Although it may be taken as read that older employees will feel less inclined to leave their roles for new ones, it’s surprising how many are still at risk of churning: a sizable 25% of boomers identified as likely or highly likely to leave their role in the next year. The following questions explored why these figures are so high, and what HR managers can do to limit the damage. Unless unknown and radical external influences transform the nature of work, payment will usually take precedence – but that doesn’t mean it’s the generations’ only criteria for reward. Despite many compelling arguments against its very existence – or at least its practicality as a theory – work-life balance ranked as the most important driver of new employment after salary. Gen X most value work-life balance, with 37% agreeing that it’s the single most important factor after pay, compared to 32% of both millennials and boomers. 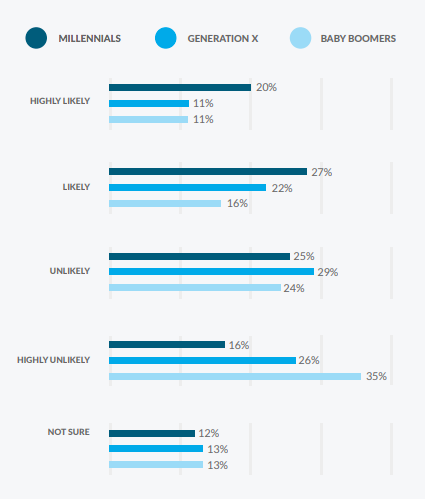 The generations value benefit packages almost equally, with 65% of millennials, 57% of Gen X and 51% of baby boomers saying that receiving them would increase the likelihood of their remaining at their companies. 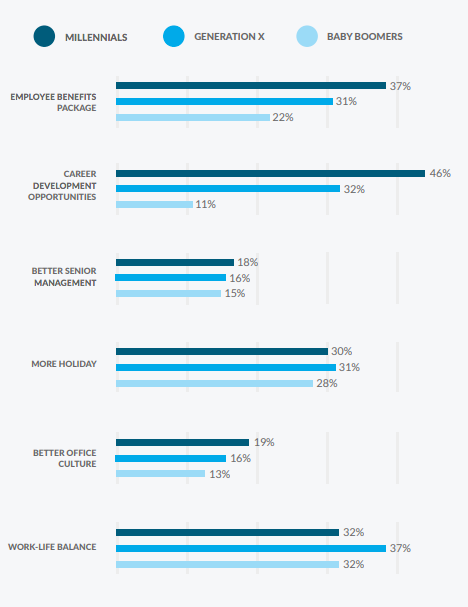 In a separate question depicted below, over a third (37%) of millennials went as far as to say they could be drawn away from their current workplace by offers of these packages – 31% of Gen X and 22% of boomers agreed. Other than salary, which of the following would attract you to move from your current employer to a new one? Employee referrals have long been recognised as one of (if not, the) most effective and efficient means of recruiting new employees – that’s why most organisations offer a sizable referral bonus for those who recommend successful candidates. But, according to our results, existing cash incentives aren’t doing enough to encourage referrals – particularly from the older generations. Just half of all generations – 53% of millennials, 49% of Gen X, and 47% of baby boomers – said they would be likely to refer a member of their network to their company. The gradual decline in willingness to recommend is mirrored by the percentages of the generations that would actively discourage friends and associates from coming on board. Some 41% of Gen X and 43% of boomers said they are unlikely to refer a friend, compared to 39% of millennials. The readiness of employees to encourage their own networks to join their organisation is often a good litmus test of overall company culture. In other words, although internally promoting the existence of referral bonuses could increase their regularity, they will come organically if your company culture is thriving. Following that, simplifying your referral programme – perhaps a LinkedIn profile link and a recommendation is sufficient – will help increase volume. Exploit what’s perhaps your workforce’s finest asset – the oldest generation’s accumulated expertise and wisdom. Consider placing the baby boomers at the centre of mentoring programmes for the younger generations. According to our research, boomers are the most loyal cohort, so be sure to repay the favour by providing stability. Ensure visibility around pension provisions and other wellbeing schemes. Present opportunities for part time work and consultation. Although this cohort are reaching retirement age, signs suggest they’ll be part of the workforce for a long while yet, so link their future needs with your organisation’s resources. Don’t make the mistake of assuming the oldest generation doesn’t still crave feedback and both public and private acknowledgment. This communication should be consistent throughout the ages. Provide extra tech support, if required. Although this advice is true for all three generations, the research shows that Gen X have a particularly independent approach, so set them clear goals but with few restraints. Where possible, offer them a flexible environment. Having typically reached or nearing the apex of their career, provide Gen X workers with the direction they need to achieve their full potential. Give the cohort room to grow by opening up opportunities, whether it’s department expansion or chances to rise up the ranks. If required, provide extra support and flexibility around childcare. Our research suggests that millennials are the most willing to get on board with their organisations’ visions, but are yet most likely to churn. 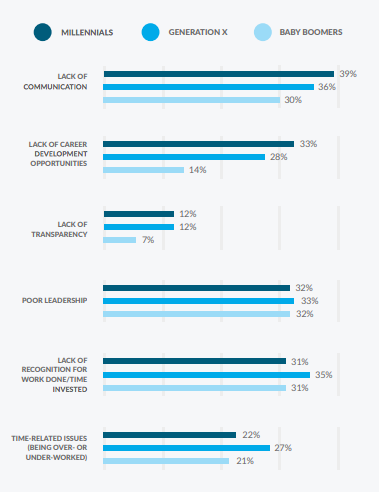 In order to address this disconnect, managers need to communicate the long-term value and stability that comes with their position in the company. Reward millennials with positive feedback for accomplishments such as reaching milestones. Recognise their loyalty and personal investment with employee benefits packages. Despite already feeling the most aligned with their organisations’ goals, millennials identified as most willing to become more aligned. Achieving this means encouraging your workforce to think beyond their personal and team objectives, towards a wider company movement.